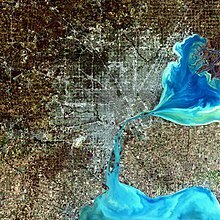 The Detroit metropolitan area, often referred to as Metro Detroit, is the metropolitan area located in Southeast Michigan centered on the city of Detroit. As the home of the "Big Three" American automakers (General Motors, Ford, and Chrysler), it is the world's traditional automotive center and a key pillar of the U.S. economy. The city of Detroit is the largest city in the State of Michigan and the 11th largest in the United States. At its core, Metro Detroit comprises the counties of Wayne, Oakland, and Macomb. These counties are sometimes referred to informally as the Detroit Tri-County Area. The Detroit Urban Area, which serves as the core of the Metropolitan Statistical Area, ranks as the 9th most populous of the United States, with a population of 3,903,377 as of the 2000 census, and area of 1,261.4 square miles (3,267 km2). The United States Office of Management and Budget defines the Detroit–Warren–Livonia Metropolitan Statistical Area (MSA) as the six counties of Lapeer, Livingston, Macomb, Oakland, St. Clair, and Wayne. As of the 2000 census, the MSA had a population of 4,441,551. The Census Bureau's 2008 estimate placed the population at 4,425,110, which ranks it as the eleventh-largest MSA. The MSA covers an area of 3,913 square miles (10,130 km2). The nine-county area designated by the United States Census Bureau as the Detroit–Ann Arbor–Flint Combined Statistical Area (CSA) includes the three additional counties of Genesee, Monroe, and Washtenaw, the metropolitan areas of Flint, Ann Arbor, and Monroe, plus the Detroit-Warren-Livonia MSA. It had a population of 5,357,538 as of the 2000 census. The Census Bureau's 2008 estimate placed the population at 5,354,225. This CSA covers an area of 5,814 square miles (15,060 km2). Lenawee County was removed from Detroit's CSA in 2000. With the adjacent city of Windsor, Ontario and its suburbs, the combined Detroit-Windsor area has a population of about 5.9 million. When the nearby Toledo Metropolitan Area and its commuters are taken into account, the region constitutes a much larger population center. An estimated 46 million people live within a 300-mile (480 km) radius of Detroit proper. Immigration continues to play a role in the region's projected growth with the population of Detroit-Ann Arbor-Flint (CMSA) estimated to be 6,191,000 by 2025. At only 1.06 miles (1.71 km) in length, Interstate 375 (I-375) in Detroit has the distinction of being the shortest signed Interstate Highway that is up to Interstate Standards. Only the unsigned I-878, I-110, and I-315 are shorter. I-375 is the southernmost leg of the Walter P. Chrysler Freeway. It is a spur off I-75 into downtown Detroit to end at the unsigned Business Spur Interstate 375 (BS I-375), better known as Jefferson Avenue. The freeway starts near the Renaissance Center downtown and turns northward. Between 14,000 and 54,000 vehicles use I-375 on average each day. Construction on the freeway started on January 30, 1959, and it opened on June 26, 1964. Anna Gordy Gaye is an American songwriter and composer, known as the elder sister of Motown founder Berry Gordy and the first wife of soul legend Marvin Gaye, who used their troubled marriage as the focal point of his critically acclaimed 1978 effort, Here, My Dear, an album in which Gordy agreed to receive royalties on due to their divorce court proceedings. The Italian Renaissance Revival-style home that Henry Ford lived in on 140 Edison Street in the historic Boston-Edison District while living in Detroit in the early 20th century. Grosse Pointe refers to an area of Metro Detroit, Michigan, United States that comprises five upscale adjacent individual communities. From southwest to northeast, they are Grosse Pointe Park, Grosse Pointe, Grosse Pointe Farms, Grosse Pointe Shores (incorporated in 2009 from the remnants of two townships, Grosse Pointe Township in Wayne County and Lake Township in Macomb County), Grosse Pointe Woods. The terms "Grosse Pointe" or "the Pointes" are ordinarily used to refer to the entire area, referencing all five upscale individual communities, with a total population of about 50,000. The Grosse Pointes altogether are about twelve square miles, bordered by Detroit on the south and west, Lake St. Clair on the east and south, Harper Woods on the west of some portions, and St. Clair Shores on the north. The cities are in eastern Wayne County. The Pointes begin six miles northeast of downtown Detroit and extend several miles northeastward, in a narrow swath of land, to the edge of Wayne County. You are invited to participate in the Detroit task force, a task force dedicated to developing and improving articles about the Greater Detroit area.